I wonder if it's possible to change the theme background, because as you can see this theme doesn't go well with my browser setup (repeating). I have made a higher version of the image but i can't find where to put it. I'm using this theme. 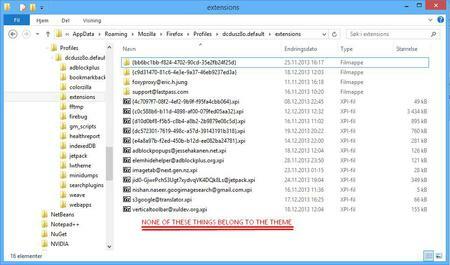 I have checked everywhere in the Firefox folder and I have checked every single item in the Extensions folder (see below) but i can't find where to put my custom image. 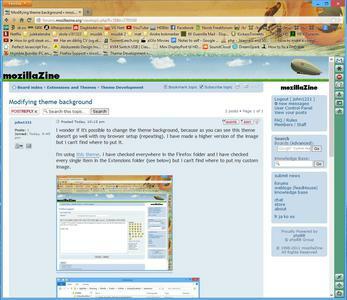 In your profile folder, they are called lightweighttheme-footer and lightweighttheme-header. 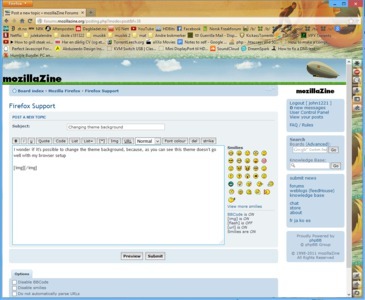 Rename them the .png or .jpg files, then you can open them. Or, just rename your files to those and replace the ones in your profile folder with Firefox CLOSED. Thanks, that was the perfect solution.